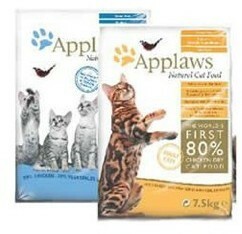 Details: Applaws Natural 80% Meat Dry Adult Chicken Complete Cat Food. 80% Chicken - 20% Vegetables and Natural extracts. Cereal Free. Prebiotic - naturally hypoallergenic. Enriched with Mineral DHA EPA. Natural Cranberry extracts - helps maintain urinal tract health.